This CFR-sponsored Independent Task Force warns that "escalating attacks on countries, companies, and individuals, as well as pervasive criminal activity, threaten the security and safety of the Internet." The number of "state-backed operations continues to rise, and future attacks will become more sophisticated and disruptive," argues the Task Force report, Defending an Open, Global, Secure, and Resilient Internet. With the ideal vision of an open and secure Internet increasingly at risk, the Task Force urges the United States, with its friends and allies, "to act quickly to encourage a global cyberspace that reflects shared values of free expression and free markets." 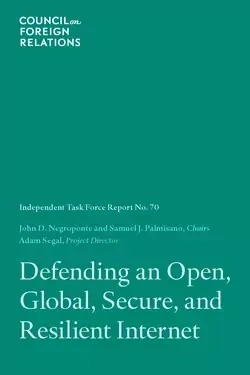 The Task Force concludes that "the most pressing current threat is not likely to be a single, sudden attack that cripples the United States," but rather "a proliferation of attacks that steal strategically important or valuable data and destroy confidence in the safety and trustworthiness of the Internet." The U.S. administration has named China as a major source of cyber espionage, and the Task Force also finds China to be a serious cause of concern. The Task Force finds that improved cyber defense and greater resiliency are necessary, but not sufficient. "Offensive capabilities are required to deter attacks, and, if deterrence fails, to impose costs on the attackers." It calls on the United States to launch an "interagency economic counterespionage program that will help prevent foreign services and corporate competitors from stealing secrets from U.S. industry." The Task Force is chaired by John D. Negroponte, former deputy secretary of state and director of national intelligence, and Samuel J. Palmisano, former chairman of the board and CEO of IBM, and is directed by Adam Segal, CFR's Maurice R. Greenberg senior fellow for China studies. It includes experts representing a variety of sectors, including high-tech industry and hardware and software companies, as well as leaders on cyber issues (see list below). The report notes that the number of people online will double to five billion by the end of this decade, and the Internet economy will continue to grow. In the United States alone, the Internet economy, now $68 billion, or 4.7 percent of GDP, is projected to rise to 5.4 percent in 2016, so any successful policy response will have to include the business community and civil society. A number of governments are using the threat of cyberattacks to justify restrictions on the flow of information, data, and knowledge and are territorializing the Internet based on narrow national interests. The outcome of blocking and filtering is "a fragmented Internet and decline in global free expression." Therefore, the report urges leading nations to agree on a set of norms for activity and engagement in cyberspace. "Now is the time for the United States, with its friends and allies, to ensure the Internet remains an open, global, secure, and resilient environment for users," says the Task Force. The report criticizes the United States for "a lack of a coherent vision, the absence of appropriate authority to implement policy, and legislative gridlock." It says, "For the past four decades, the United States was the predominant innovator, promoter, and shaper of cyberspace, but the window for U.S. leadership is now closing." "The bottom line is clear: digital foreign policy must begin with domestic policy," the report concludes. "Successfully meeting the challenges of the digital age requires a rethinking of domestic institutions and processes that were designed for the twentieth century." Esther Dyson, EDventure Holdings, Inc.
Susan Markham Lyne, AOL, Inc.
Lawrence P. Tu, Dell, Inc.